CinemaCon 2018 attendees also will be among the first to experience the Samsung Onyx’s powerful multi-sensory viewing environment. Each Samsung Onyx screen features state-of-the-art JBL Sculpted Surround ™ sound from HARMAN’s JBL Professional brand, bringing scenes to life through clear and consistent audio. This integration enhances the listener experience while expanding the audio “sweet spot” within Onyx theaters, and ensures that all attendees can enjoy the same exceptional audio presentation regardless of seat location. “JBL Professional’s legacy dates back to the infancy of talking motion pictures and has been at the forefront of the industry’s sound recording and amplification innovation for the past nine decades, twice earning Scientific and Technical Awards from the Academy of Motion Picture Arts and Sciences, making it the preferred brand for cinemas all over the world,” said Mohit Parasher, Executive Vice President of HARMAN and President of HARMAN Professional Solutions. “Bringing the ground-breaking technology of the Samsung Onyx Cinema LED screen together with HARMAN’s innovation of the JBL Sculpted Surround system delivers the ultimate and unmatched audio visual audience experience.” Samsung also will preview the Onyx’s 3D screen capability at CinemaCon 2018. The 3D Onyx Cinema LED screen accomplishes the uncanny feat of making 3D movie content even more realistic through enhanced brightness and consistent color amplification. Glass-wearing viewers now can enjoy subtitle text, images and even minor visual details with unprecedented clarity and without the dark, blurry shadowing and potential dizziness that can occur in traditional 3D movie theaters. 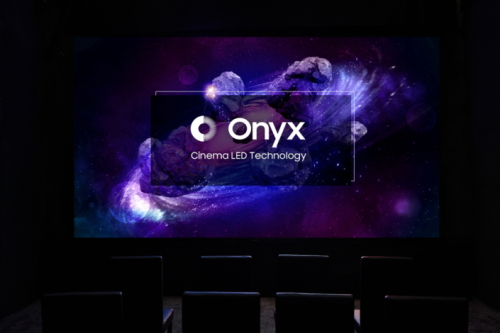 As more theaters upgrade to the Onyx screen, Samsung is working with cinema content developers to ensure that the display can optimize upcoming films. Notably, Samsung will collaborate with leading cinema technology services provider Ymagis Group and its Eclair content development business unit to deliver EclairColor® HDR-compliant pictures that shine on the Onyx screen. CinemaCon 2018 attendees will get a sneak peek at the benefits of this alliance, as Samsung will unveil EclairColor-enhanced visuals on its next-generation display. Samsung also recently announced partnerships with Golden Screen Cinemas – the largest cinema company in Malaysia, with 35 venues and 328 screens throughout the nation – and Cineplexx Cinemas – the largest cinema company in Austria, with 171 screens nationwide - to bring the Onyx screen to moviegoers in each country. The first locally revamped Samsung Onyx theaters are expected to open in Kuala Lumpur and Vienna, respectively, later this year.